Remembering Lydia Schatz, now held in Jesus’ arms. Okay, so my boys might be a little old for playdough, but I think we’ll be making this recipe this week anyway. It’s good for fidgeting with while discussing school or reading books and we have plenty of younger friends to pass it along to when we are through. For friends who lean earthy-crunchy, instead of the artificial colors and scents of Kool-Aid®, you can use cinnamon, cocoa powder, essential oils, beet juice or other creative items around. So, from the archives, Kool-Aid® Play Dough. Mix flour, salt, cream of tartar and Kool-Aid® in a pot. Add oil and water. Stir over medium heat until texture changes and forms a ball in the pot, about 3-5 minutes. Let cool to touch. Kneed until smooth. Store in a platic bag in the fridge. Notes: I usually double the recipe or make a bunch of batches at once. This can be made without the cream of tartar (which is a preserving agent.) You can also use glycerin or vinegar as a preserving agent. This has been a fun party favor with our Ukrainian kid-friends. February included rounds of exotic immunizations, appointments, a final pack-out, and a good-bye open house. We flew through London to Nairobi and took a few extra days to tramp through the city, eat fish and chips, visit Westminster Cathedral, and celebrate R’s 12th birthday. We arrived in Nairobi right at the end of the month–it was good to be “home.” Thanks to preparations by a friend, we even had a fridge full of food, sheets on the beds, and most importantly, fresh Kenyan coffee! March meant Hubby hitting the ground running at his new job, and he’s really excelling. Our first weekend in town, the boys got to ride ostriches and had ostrich nyama choma (barbeque.) J14 and T13 entered Rosslyn Academy – the first time they’ve been in school since 4th and 1st grades. Re12 and C10 continued to homeschool. We found a great truck—a bit beat up, but very practical. Just driving in our neighborhood required constant off-road detours and mud-bogging due to construction. It is a manual transmission, and took a few months before I braved driving it, especially since everyone drives on the “wrong” side of the road! April brought our first visitor, Andrew, who holds the distinction of visiting us no matter in which corner of the globe we live! (We’d welcome more visitors, too, but understand Nairobi is off the beaten path. . .) We also enjoyed a safari on Crescent Island, where we got to walk among the animals. We even saw a giraffe baby nursing and what looked at first to be an injured little zebra – later we realize it was probably just a newborn! May meant wrapping up school. J14 played rugby, and was “most promising player” for the under-15 teams. Our family got its first dog – an African hound/rott mix we named Buckley. All four boys went to their first sleep-over camp, Camp Bluesky. One perk of living in Africa is that camp includes some pretty exotic trips and activities like camping with the Maasai! June is the beginning of winter in Nairobi – overcast days, sweater weather. J turned 15 and discovered the joys of the Kindle. I began volunteering with Mercy House maternity home. July was a low-key month. Hubby and I celebrated our 16th anniversary. August on the other hand, was quite exciting. I took a last-minute gorilla trekking trip in Uganda. Immediately after I got back, we discovered that baby #5 was on the way (due late April 2012!) We’re all thrilled, especially the four big brothers. Hubby was able to take leave for the first time since we arrived, and so we went on safari in the Maasai Mara – elephant, lion, wildebeest migration, zebra, giraffe, hyena – everything you would imagine seeing in the wilds of Africa! Right at the end of the month we had the adventure of driving from Nairobi to Mombasa (crazy drivers on a narrow two-lane highway) and spending a week at a friend’s beach house on the Indian Ocean. It was peaceful, restful. . . and Hubby and the boys started plotting out a fantasy series they want to write together. September meant back to school. . . This time the younger three boys started at Rosslyn Academy (first time in school for C11, 5th grade!) and J (10th grade) continues to homeschool. He wants to study economics and classics, and has an opportunity to intern in Uganda. October brought the official publication of John’s scifi book, “Knox’s Irregulars.” He wrote this book eleven years ago, when we were in language training before moving to Ukraine. It’s exciting to see the fruition of his work and even more exciting to hear how much people are enjoying it! November included the news that baby #5 is a BOY. We have a fun guest who needed a change of pace from Malawi. We celebrated a traditional Thanksgiving at a friend’s home, enjoyed having Andrew visit (4th time!) and the kids did a fun “What Thanksgiving if About” play for guests from South Africa, Bolivia, and Uganda. C turned 11 and T turned 14 right at the end of the month. December brought the end to my grad school pursuits, culminating in a Master in Nonprofit Management degree. (Would love to hear about any short-term projects to work on!) We’ve enjoyed our Advent and Christmas traditions, incorporated with new things from Kenya. We rejoice in God sending a Savior ! Into 2012. . . The boys and I will be in Florida from March – May, as the medical unit here recommends returning to the US to have a baby. We welcome you to come visit us in Kenya before our anticipated departure in February 2013! Baby is moving about — doing the happy dance with me!? Last assignment and paper for my master’s degree is submitted! Can I just brag on my Hubby for a few minutes? 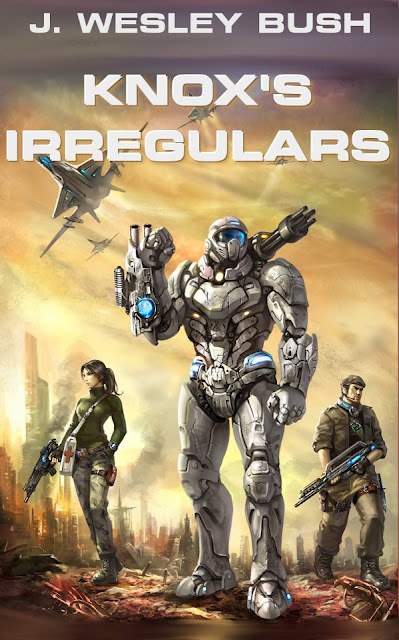 Hubby’s book, Knox’s Irregulars, is now available on Amazon! I’m really proud of him (as any wife would be.) But, really, his book is GOOD. The first draft was written nearly 11 years ago, when we were in Russian language school. It was revised in Ukraine, and put on the back burner when he was in grad school. But now, it’s published! Go over to Amazon and buy it. . . just $2.99 for the Kindle edition. (It will soon be available in paperback, as well as on Barnes and Noble for Nook.) If you don’t have a Kindle, you can download a free Kindle app for your smart phone or computer. What is it Like to be Raised by Pearl Parenting? This is a repost from what a friend shared about three years ago, The Fruit of Pearl Parenting. What isn’t in the news are the many children who are abused, often by loving, well-meaning parents. When family relationships are disrupted or families have abuse that isn’t reported or doesn’t end in death, we don’t hear it. But the Pearls and their teachings have been around long enough for older children and adults to share the fruit of these ideas. Please be clear, I’m not saying that normally healthy families don’t have problems — we all do. We all struggle and need to lean into the grace the Gospel of Jesus Christ in our families. Hurt and pain happen to all of us in this fallen world. But embracing false teachings such as these only makes it worse. . . Thank you for sharing with such transparency, Jo. “You want to talk fruits of a parenting? Let’s compare and contrast myself with…oh MY PARENTS. My mother is a faithful and avid reader of NGJ. She adores the Pearls and when I first became a mother made it very clear that to be a good mother I needed to adhere to their methods as well. “While I was not raised specifically by TTUAC because it was not yet written, I was raised in that same method, in that same Christian culture and my mother certainly does adhere to TTUAC methods with the 5 she is currently raising. “So, let’s see. Mom has 3 adult children and 1 on the verge with which to judge her parenting. Oh but wait, she doesn’t speak to her adult children anymore. We’re too dysfunctional and of this world now for her to have time for. And, for our own part, we happen to believe she should have been locked up for her selfish parenting and her child abuse…oh, that’s right, the Pearls call it Biblical parenting. My sister’s therapist recently called it battery acid. I thought that was a good description. “So, my mother has 3 thriving healthy adult children whom she has no contact with whatsoever. She has 8 (with a 9th on the way) grandchildren, all of which she is forbidden to have any contact with. Her 17 year old is desperately waiting to finish high school next year so he can get out of her house and has NO intention of speaking to her once he leaves. Her 14 year old hates her and tells me this via emails when she gets a chance. Her 12 year old…well, he’s attempted to run away repeatedly now. Verdict is still out on the 11 and 10 year olds. But, to be quite honest, that’s not a track record I would want for my parenting of 8 children. At least 5 either have no contact or openly state they will have no contact once they are old enough to leave her home. “Good, Pearl Biblical parenting at work for you, ladies. I lived it. I should know. “Meanwhile, I subscribe to a gentler, more loving parenting style. I prefer to parent as if Jesus were actively watching me and actively reminding me that I must be like a child to enter the Kingdom myself. “My children are amazing. I don’t just say this as a proud mother. My youngest son’s therapist informed me Thursday he’s NEVER met children like mine. Church members weep to see the beauty of my children. Heck, I weep to see the beauty that God has blessed me with in these children. “Oh, therapist you say. Yes, see my youngest son is still a fosterchild. He has huge demons in his heart and soul still. We’re still fighting. No, we’re not waiting for the countdown until we can spank him. We’re fighting to help him heal. “And, here is the TRUE mark of my children for you. This week, my son’s therapist told us to give up on him. Told us the cost to save him will be too great for the other children to pay. “Being good parents, we discussed this with the other children. Afte rall, the fight to save and heal this one will take the largest toll on these children. I honestly expected at least a few of the children to say yes, we must give up. “They didn’t. And, they had no reason to feel they had to say something *we* expected, because we are honestly weak and fragile and aren’t sure we can help this child heal. “Nope. My children clearly demonstrated the love of Christ in a way I had forgotten in the trenches with this hurting child. They unanimously told us we MUST carry on. They LOVE him, even though they know he does not love them. And, as far as they are concerned, his life is worth what it will cost them. Furthermore didn’t we, mommy and daddy, remember that this is precisely what Jesus would have us do? This is what Jesus wanted us to do And, no matter how naughty and difficult this child is, Jesus still loves him and we must too. “I’m not a perfect parent. Far from it, honestly. But, I didn’t spank this fruit of the Spirit into my children. I showed them by example what it means to live a life in the shadow of the Cross. And, they have chosen to find their own path to that Cross and to live a life always conscious of what their Savior would have them do. I didn’t stand and attempt to BE their Savior, as Pearl would tell us we should. I merely allowed my life to be an example to point the way to that Cross. Their Savior found them, each and every one of them, he claimed them and they have chosen to follow HIM, not me, HIM. “And, unlike Micheal Pearl, when my children went to that Cross to find their Savior, they never found me there telling them I represented their Savior. They found a merciful and loving God one they have chosen to follow. And, today, one they have chosen to remain in obedience to even at a high cost to themselves to fight for the heart of a little brother who has never known true love and true commitment and safety before entering this home and being surrounded by these siblings. “Now, I’m sorry. But, for me the question of whether to follow Micheal Pearl or my Christ is a very simple answer. I look at my parents who followed Pearl and I see the fruits of their labors. And, I look at my children, whom have been raised with the love and mercy that a forgiving and protective Creator would have them raised in. I see fruits in my children which humble me. I see hearts in tune with their Creator in ways I can only wish to be. And, I realize quite simply that Micheal Pearl has missed the mark. “Hurting children? Yup, missing the mark and deciding to be the Savior for your children is definitely hurting children. I should know. I was one of those children hurt by this parenting method. Thank you, Jo, for sharing from such a vulnerable place in life. May God continue to heal your family and your children — as well as your parents and siblings still struggling. The Pearls have published a response to Hana Williams’s death. Unlike with Lydia Schatz, they are no longer laughing. Parents who utilize and/or support No Greater Joy Ministries, Michael and Debi Pearl, or the book “To Train Up a Child” sometimes have trouble understanding how a book they find “helpful” can really be so harmful. This is similar to the excuse the Pearls make themselves. . . it is never parents following their teachings who abuse — but parents who are NOT following their teachings. But, when parents are struggling or their children aren’t conforming, they go back to TTUAC. And what messages are found then? Consistency (which can be good), and beyond that a “parents-must-win-at-all-costs” message. It doesn’t take long to see that if a child is not “easily” trained and compliant immediately, a parent trying to do the “right” thing will be led by the Pearls’ teachings and philosophy to abuse. A child who doesn’t understand, doesn’t comply, or isn’t submissive right away. . . A parent is taught to be consistent, defeat totally, continue spanking/swatting/smacking. . . In this context, can you see how easily the Pearls’ teachings can lead to abuse? I’ve know parents. . . loving, well-meaning, dear parents. . . Parents who never spanked in anger. . . who got to the point where they saw they were ABUSING their children (in love. . . with good intentions) because of this underlying theme of consistency and total defeat. Does this help make sense of why some people are very upset and alarmed about a resource some parents only remember as helpful? Long before the tragic deaths of Sean Paddock, Lydia Schatz, and Hana-Grace Rose Williams, Christians have been raising concerns about the parenting and theological teachings of Michael and Debi Pearl. In spite of the folksy encouragement to “tie heartstrings,” the underlying philosophy of the these teachings miss out on the place of the Gospel in parenting the littlest disciples in our families. I am re-posting an email conversation I had with a young woman several years ago, because I believe it can help people who are upset about these children’s deaths understand that larger, harmful philosophical context of the Pearls teachings. Similarly, I think it can help parents who have only gleaned a few good ideas from the Pearls understand why so many other parents find the overarching message to be harmful. This is an e-mail conversation I had with a young woman not long ago about the Pearls and their highly punitive parenting ideas. Although I’m more concerned about helping parents see the problems with Ezzo, I decided to make available here some of my thoughts about the Pearls/To Train Up a Child/No Greater Joy. Hello, TulipGirl. My name is *******, and we’ve crossed each other’s paths on a board by a woman named ********* talking about the book To Train Up a Child by Michael and Debi Pearl. I’ve been researching all I can about the Pearls, and I’ve come across your name a couple of times. Research is good. I’m sure you’ve found a mixed bag of people who are thrilled with TTUAC and those who aren’t–as well as those who are rational about their opinions about TTUAC and those who are very emotional or accusatory. The Pearls aren’t my “pet issue” so I’m a bit surprised you came across my name a few times. I looked back through some things I’ve posted online and realized I had written more than I thought about them. First, I’m interested to know what you (and others) find so objectionable about the Pearls. The heart of the issue is that they are teaching something they claim is Biblical, but is instead based on Behaviour Modification and building a subculture. They are very persuasive, especially to young parents. I believe their underlying philosophy goes against applying the Gospel of Jesus Christ in our family life. One way this comes up is, while there is mention of “tying heart strings”, there is far more that leads parents/children into an antagonistic relationship. The parent/child antagonism is one of the key problems I have with the ******** site, in spite of the many professions of love and delight in children. The attitude behind “ambushing” children is antagonistic. The attitude of “power struggles” and “outlasting” is antagonistic. And, I believe, unsupportable Biblically. Galatians 6 talks about discipline. . . “Brothers, if someone is caught in sin, you who are spiritual should restore him gently. But watch yourself, or you also may be tempted. . .” Restoring gently, being careful yourself–that sounds nothing like the Pearls. Of course, the Pearls were talking about their dog here–but in the context of training children. The message is “What is a child good for, but to elevate his parent?” The focus shifts from discipling the little blessings God has given us, to placing our children’s worth on how well they perform. As well as deriving our worth as adults on our children’s performance. Sadly, I know a lot of Christian parents who fall into the trap of thinking that way–that our children must be perfectly behaved, especially around others–and that leads parents and children into legalism, rather than into building a stronger relationship with one another and trusting in God. Pride and trusting one’s “child training” can sometimes quench one’s trust in God. I believe our parenting should be shaped by our theology–and I’ve found as I’ve grown in my walk with the Lord and in studying theology that it has impacted my parenting in a very big way. I read a passage in the TableTalk devotional recently that pointed out to me, yet again, how theology impacts parenting. Our children are part of the Covenant, and I believe Christ has already suffered the punishment for their sin on the Cross. I do not need to “punish” them when they do wrong. I do need to discipline them, disciple them, help them see their sin and repent, as well as help them learn the “rules” of living in polite society. I am not permissive. But I do not think that using a rod to spank my toddler, ala Pearl, will cleanse them of sin. Nor do I see any command in the Bible for parents to punish children for their sin–I do see many commands to disciple, discipline, teach, love, train and chastise. I did a study on the Fruit of the Spirit several years ago. One of the things that surprised me was that in so many passages that talked about gentleness, it was linked with discipline. God puts the two together. There are other things related to what I’ve studied in the Bible and theology that leads me to have concerns about the Pearl’s parenting, but I don’t want to overwhelm you. Is there anyone that we would say we agree with 100%? *grin* I’m curious what you disagree with that they teach? But their principle – that children should obey their parents – seems sound. Biblical, even. *grin* Btw, it isn’t “their” principle or even that (obedience) which is what is controversial about what they teach. I’m not sure whether I mentioned over at ******’s or not, but I started my parenting journey with a strong view that I was required to make my children obey. Now I believe that I am called to help them obey, as they become the people God has created them to be. There is a world of difference between the ideas make and help. And again, while sometimes they go overboard, I think their style of parenting – strict – works in the long run. In what ways do you think they go overboard? Are you aware that there are many parents who are strict who don’t embrace a Pearl parenting style? You’d probably agree with a “mean what you say and way what you mean” attitude in parenting. Are you aware there are parents who do that without resorting to either “ambush” swats or bribery? I mentioned on xxxx that according to one study, children who had strict boundaries were less likely to end up taking drugs as teenagers. Firm boundaries, I believe, are a good thing. The Pearls don’t have the corner on the market for that. That is not unique to their teachings. One friend of mine, Joanne, is very firm in her boundaries but enforces those boundaries in a way that isn’t laced with Pearl-esque Behaviour Modification. Take a look Joanne’s Discipline Resource Center (now defunct). One characteristic of those teens who did take drugs was that their parents had difficulty punishing them as children. Second, I think a lot of people tend to lump Pearl and Ezzo together in the same boat as a knee-jerk reaction. Knee jerk? Some people online do seem to be a bit reactionary, don’t they? *grin* The vast majority, though, seem to understand the issues either from experience, evidence-based concerns or the Bible. I respect a parent’s decision never to spank, but somehow to me the anti-spanking movement has become a bit of a cult: Thou shalt not spank. I can’t defend the anti-spanking movement as I’m not part of it, per se. that they, not the parents of that particular child, know what’s best for somebody else’s family. That’s interesting. I hear more “This is the only way to raise Godly children” from people advocating the Pearls, the ******, the Ezzos–and a lot of condescension to those poor mothers who don’t know any better or are too “afraid” to spank. To be honest, I would love to see more grace and patience shown to mothers with different values in parenting from all involved. I am completely convinced that parents who embrace a Pearl style of parenting are doing so out of love for their children. However, love is shown by actions as well as attitudes, and the actions the Pearls advocate are very often unloving. The final thing: the “Pearl” method of parenting is similar to that our parents and grandparents used, to some extent, and which they still use in some countries today. It’s hard to believe that modern-day North American kids, who are less likely to be physically punished, are really so much better off psychologically than everyone else. Likely, we will all be psychologically messed up in one way or another by mistakes our parents made. I believe a mother’s love and God’s grace cover a multitude of mistakes. Having known people both brought up in a Pearl manner, as well as talking with the older generation you appeal to, well, I see plenty of problems. Another guy I know was the poster child for Pearl parenting. He courted a young lady, they did everything “right”, were married and divorced two years later. Only then did it come out that he had been living a double life–the “good kid” around the homeschool groups and church, and the rebellious adult he had become. Good, godly, strict parents. . .
Another family’s oldest son started sleeping around at 12 (again, a family who was doing everything “right” by the ideals taught by the Pearls and related subcultures) and is still involved with drugs at 25. These were dear, praying, active Christian families who were strict and didn’t “spare the rod” but were sure to use it. They were consistent, involved in church, homeschoolers (all of them) and definitely “tying heartstrings”. I’m sure you can find good results to balance each of these sad results–but that’s not the point. The point is the almost-blanket-guarantee that is given by the Pearls is just not sound. Early child training through quick swats when kids disobey will not guarantee an obedient child, a non-rebellious teen, or a spiritually secure and emotionally healthy adult. I suppose the only way to “test” the Pearls’ method would be to compare, say, 100 families who used the Pearls’ method and 100 who did not. And even this would be difficult because the two groups of families would probably differ in many other ways too. Most of the anecdotes I hear about the Pearls are positive, so in some ways I don’t know why if it worked for others it would not work for me if I had kids. *L* Well, I guess I got ahead of the flow of the e-mail with the above descriptions of some problem-child Pearl scenarios. Whether or not it “works” is in large part determined by how you define “works.” My goal is to help my children become the people God has created them to be, with an emphasis on them relying upon God’s grace for their daily living. I want to help them learn to recognize their sin and turn to God in repentance. I want to model for them what it looks like to lean into God when we are struggling. Meeting these goals is how I’ll eventually be able to measure whether my parenting choices are “working.” But, I can tell you now, that the teachings from the Pearls will not “work” for meeting these goals. So I guess I just wanted to know the reason for your animosity towards the Pearls (and I’m not advocating the Pearls; I’m just curious as to why some people are so vehemently against them). I hold no personal animosity towards the Pearls. I do oppose their teachings because they teach Behaviour Modification and call it “Biblical training.” I oppose their teaching because while it may seem to “work” in the short term for some families, it sets up an antagonistic parent/child relationship based on control. I oppose their teachings because it leaves little room for the Holy Spirit to work in the lives of the parents or children, and does not turn the children towards the Gospel of Jesus Christ. Pulling me out of this blogging hibernation is another heartbreak. Again. Dear God, have mercy. . . not again? I’d rather write about happy things. . . about the joy our family has in expecting our new baby, about the fun of our first safari, about the quirky experiences of living in a different culture. But, I’ve been tired lately (thanks, first trimester) and homeschooling and school-building-schooling and finishing my master’s. Writing and blogging has taken a back seat to real life. Another child has died. RIP, Hana Grace Williams. This is the “probable cause” document filed by the investigating detective which explains the abuse, cites “To Train Up a Child” and recommends the arrest of the Larry and Carri Williams. Arrest warrants were requested by investigating detective Theresa Luvera for adoptive parents for “Homicide by Abuse” and “Assault of a Child 1st Degree”. (Court reference numbers: Carri Williams 11-1-00928-8, Larry Williams 11-1-00927-0). This is Hana Grace Williams. She was born in Ethiopia, and died at age 13 in Skagit County, Washington. Her death was attributed directly to hypothermia, with malnutrition and helicobacter pylori chronic gastritis contributing. Now, there are some flavors or textures that we just have an aversion for. Allow each child one or two dislikes, just don’t let their preferences be too limited. If a child doesn’t like what is on the table, let him do without until the next meal. A little fasting is good training. If you get a child who is particularly finicky and only eats a limited diet, then feed him mainly what he doesn’t like until he likes it. Follow either of those with “consistency” (another key theme in the Pearls’ teachings) and it is understandable how the Williams ended up treating their adoptive children, and how it ended in the death of Hana Grace. Why Not To Train A Child? During the month of Ramadan, join in loving your Muslim neighbors by praying for them. 30 Days of Prayer resources. The GFI National Conference has now concluded. We believe and have experienced how the Lord is both over all and close at hand, and how He uses prayer. And so we ask you to join with us in prayer for the parents and teachers involved with the conference and with Ezzo parenting. Pray that the Gospel of Jesus Christ will be preached. Pray for Gary and Anne Marie Ezzo. Pray for the conference attendees to return home, ready to minister to their families. Pray that parents who do use the material will seek balance. Pray for reconciliation for the Ezzo family. Pray for resolution of the long-standing issues of church discipline. Pray for a lack of divisiveness in Ezzo promoting churches. As we wrap up Ezzo Week 2011, I want to remind everyone — those who subscribe to the Ezzo parenting philosophy and those who don’t — that ultimately each family is called to raise their children with love in the nurture and admonition of the Lord. Most families I know are doing the best they can with the resources they have. God’s grace and a mother’s love cover a multitude of mistakes, and we all make mistakes. This post is part of the Ezzo Week 2011 series. We respect parents who are raising their children with love and the resources which they have — but are looking carefully at a set of ideas, or “philosophy” as Gary Ezzo terms it, which undermine healthy families. QoTD: What Alternatives to Babywise/Prep for Parenting do you Suggest? Great alternatives to Babywise/Preparation for Parenting are available, both from a Christian viewpoint as well as a more broad, non-sectarian viewpoint. These are some of the most common suggestions. And, feel free to chime in — what are YOUR favorite resources for helping during infancy? Put down the book, pick up the baby! What about you? What alternatives to Babywise do YOU suggest? Anne shares some thoughtful insights in her article, The Nature of a Child vs. the Sin Nature. Sarah shares some things learned since having a child. Chalise has reposted her “Why I’m not Babywise” story in honor of Ezzo Week. Jessica Lang Kosa, a lactation consultant writing on “The Other Baby Book” blog, addresses about fears of parenting. Desi reminds us parenting is messy, and lovely. . . regardless of our influences. This mom is still waiting for her baby to be born, but already knows, Just say No! to parenting books. If I missed your post for Ezzo Week, just let me know! QoTD: What Alternatives to GKGW do YOU Suggest? 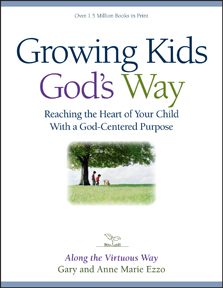 Lots of parents chimed in with great responses to, “What alternatives to Growing Kids God’s Way do you suggest?” I haven’t read all these resources, caveat emptor. [via our pediatrician 16 yrs ago] re: babies – God gave you love, a heart, common sense, & instincts; use them, not books. Alts to GKGW? How about a supportive multi-generational, grace-centered, encouragement-rich church? Need not be learnt in books. What about you? What alternatives to GKGW do YOU suggest? Chalise has joined in our Ezzo Week 2012 blogging at Memphis Misfit Mama. Recently she wrote a phenomenal, heartfelt series on Babywise. I highly recommend you read it! Things are pretty busy over at twitter. . . check out the #EzzoWeek hashtag! On facebook, there have been a lot of wall discussions and group posts. Those are harder to link to, though. Still, it’s great seeing parents encouraging and educating one another. But this mom is not happy about Ezzo Week, “then I discover an anti Ezzo blogging movement that occurs every year to coincide with the American conference! Run by Christians no less! Whether you agree with the principles or not is no reason to attack the people. What happened to judge not lest you be judged?” I sincerely hope this mom and other who feel the same way read more here. . . In all honesty, I am probably MORE concerned about Growing Kids God’s Way (GKGW) and the other materials for preschoolers/older children than I am about the Ezzo’s the infant/toddler materials. However, it is often easier to discuss Babywise (and it’s religious equivalent, Preparation for Parenting) because the problems can manifest quickly in physical ways. Similarly, it can be easier to help parents new to Ezzo parenting see the problems with the materials, than it is to bring up the flaws of Growing Kids God’s Way when parents have already been using them for such a long time. What I’ve seen to be the heart of the problem with Ezzo’s materials? Neglecting the Gospel. In striving to teach children the “moral reason why,” what is neglected is coming alongside children when they sin, helping children acknowledge that sin, and pointing to their need for the Gospel of Jesus Christ. While that is sufficient reason in my experience for parents to reject the Ezzo’s materials for older children, there are some other concerns that need to be mentioned. Each of these points will be linked to an outside resource for those who want more information. Do you have a question for our Ezzo Week Question of the Day? E-mail me! EzzoWeek@gmail.com . Please let me know whether you want to be anon or if you want me to identify you and your blog. If you read nothing else this week, please take time to enjoy this beautiful photo essay by Carol, My My “No Regrets” Alternative to Crying-It-Out”. This is one to put in the Mommy Inspiration Files. . . I oh-so appreciate Megan (Sorta-Crunchy) and her plug for Ezzo Week 2011 last Tuesday! You have to read her archives from prior years. . . very worth it! Check out The Babywise Series and well as her other babywise-ex posts. I’m looking forward to what she shares this year! Similarly, it’s always great when a btdt mom affirms your parenting. . . and I thank ThatMom for joining in the Ezzo Week 2011 promotion. Anne takes a close look at what Scripture beautifully says about breastfeeding, and examines Ezzo’s teachings which bind the consciences of new moms. “Any book or method that purports to take a lot of the work out of parenting is no better than a get-rich-quick scheme,” says AllofGrace in the comments. She’s right. Though Ezzo tries to take both sides… Both follow our program and your baby will sleep through the night and life will be easier. . . as well as, it might be hard to stick to the routine, but it is worth it to make sacrifices for your infant. And while this was posted before Ezzo Week 2011 started, this article is worth reading. . . from Get Posh To Push, Katherine identifies some key issues in the Ezzo teachings in My Beef with Babywise. . . worth reading! Please feel free to join in our Ezzo Week 2011 blogathon. I don’t always see all blog posts, facebook notes, or tweets. . . please email me or comment so we can be sure to link to you, too! This post is part of the Ezzo Week 2011 series. We respect parents who are raising their children with love and the resources which they have — but are looking carefully at a set of ideas, or “philosophy” as Gary Ezzo terms it, which undermine health families. 8th Annual Ezzo Week 2011 — Welcome! Welcome to the 8th Annual Ezzo Week 2011 blogfest here at TulipGirl! As is customary, this is timed to coincide with the annual GFI National Family Conference* hosted by Gary and Anne Marie Ezzo — this year July 13-16 in their adopted hometown of Charleston, SC. As always, we are approaching Ezzo Week 2011 from the viewpoint of Biblical, historic Christianity. While the target audience of the Ezzo teachings were originally evangelical families, these materials – especially On Becoming Babywise – are now mainstreamed into families with a wide-range of backgrounds (interestingly, Ezzo has gained a huge following among the LDS…). We invite you to read the theological critiques even if you are of a different faith or are more broadly non-religious. For those who are reading who have used ideas from Gary Ezzo’s teachings, I want to reiterate that critiques written here are not a judgment of you or your love for your child. We will analyze the materials as they are written and taught by Gary and Anne Marie Ezzo, as well as they are commonly understood and applied. However, I know that when someone criticizes ideas we like—especially in the realm of family and parenting—it can very easily feels like someone is criticizing us personally. Please keep in mind that I know many parents who apply these ideas – I was one of them – and that I understand your motivation is out of love and the desire to do the best for your child. Have you attempted to implement the ideas of Ezzo parenting in your family? What was your experience? Many people have shared how things often seemed to work great at first, but later they regretted the impact of the Ezzo philosophy on their families. This week we’ll be featuring YOUR stories and experiences. . . feel free to blog them on your on site and drop me a line or go ahead and sent them directly to the Ezzo.Info administrator at ezzo.info@gmail.com (that’s not me, btw…) We’ll be linking to your stories throughout the week. We’ll also be linking to some of the most compelling research and stories related to Ezzo parenting — both classics from the 90s (when I really thought the Church had come to its senses and had rejected these harmful teachings) as well as new medical research related to infant development. Each year we approach our Annual Ezzo Week blog-a-thon with a lighthearted attitude, though we know the issues related to loving and caring for our children are serious. We do welcome dialogue and have found that this has been a great occasion for parents from many backgrounds to encourage one another. So. . . welcome to Ezzo Week 2011! * Hey, look at that spiffy new website! I bet I know who’s behind that great site. . . And, check out the change from “leadership and alumni” conference to “family leadership” conference — kids are actually welcome this year, instead of parents being told to leave them behind. 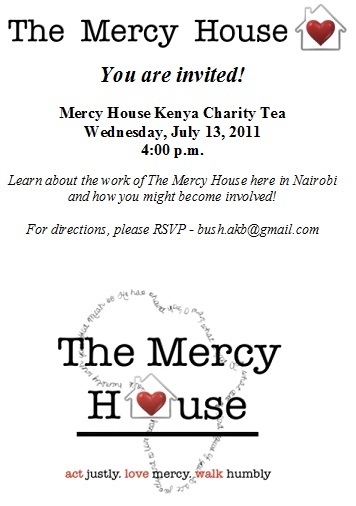 . .
I’d love to have my friends and neighbors in Nairobi come join us for tea and to learn about Mercy House Kenya this Wednesday, May 13th. Both founder Kristen Welch and executive director Maureen Owino will be talking about the work that is being done to provide a home and support for pregnant, vulnerable young women in Nairobi. Please e-mail me to RSVP, and I’ll send you directions!